In the interest of providing the best education possible, Mid-State has implemented many exciting technology advancements. The Department of Information Technology maintains desktop computers in over 30 computer labs and resource areas, including the LiNK (previously Learning Commons) on each campus. These devices are connected to the Mid-State network to allow access to the Internet and printers. Below is additional information you might need about Mid-State's public computers, hardware, and software. Public computers are available in the designated Mid-State LiNK areas. Standard software available on Mid-State desktops include Windows 10/Internet Explorer/Edge, Microsoft Office, Adobe Creative Cloud Suite, Google Chrome, and Mozilla Firefox. 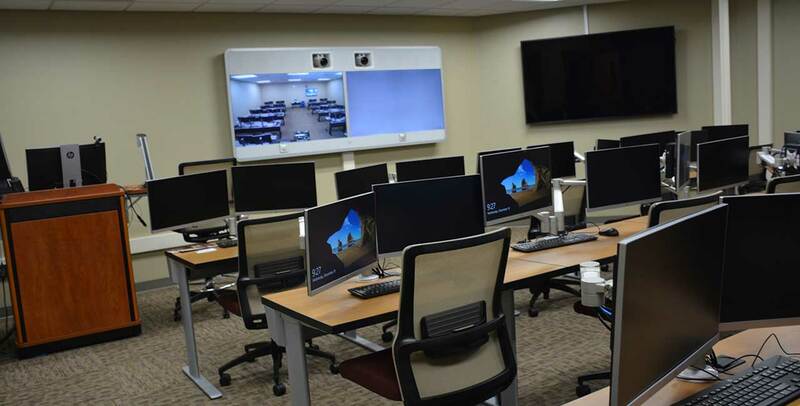 Additional software installations vary by lab and semester based on educational needs. Typical computer labs have 20–24 student computers, an instructor workstation with a collaboration and presentation system, and network printing capabilities. Food and beverages are not permitted in computer labs. Use of the labs is restricted to Mid-State students, faculty, staff, contract classes, and scheduled events. Wireless access to the Internet is available using the STUDENT-GUEST network. No password is required. Our Wireless Network page provides detailed instructions on gaining access. Students are obligated to follow the rules and procedures established by the college. Further, it is the student's responsibility to read, understand, and abide by all policies. Misuse of facilities or violation of policies may lead to termination of offenders' computer privileges and, if necessary, referral to authorities. See Network Policies for additional information.